We report herein a study demonstrating the value of urine sediment profile in distinguishing proliferative glomerulonephritis (PGN) from nonproliferative glomerulonephritis (NPGN). This distinction is of clinical importance as it helps the nephrologist recognize PGNs which usually need urgent attention and a biopsy on priority. The study included 129 biopsy proven cases, 57 of PGN and 72 of NPGN. The urine sample in each case was collected prior to the biopsy, processed according to the meticulous protocol, and all cells and casts in the sediment were semiquantitatively scored according to the method proposed by Fogazzi. The sediment was examined by bright-field, polarizing, and phase contrast microscopy in all cases. The latter is of particular importance in recognizing dysmorphic RBCs, which were reported as a percentage of the total RBCs. The results of the study are summarized in [Table 1]. 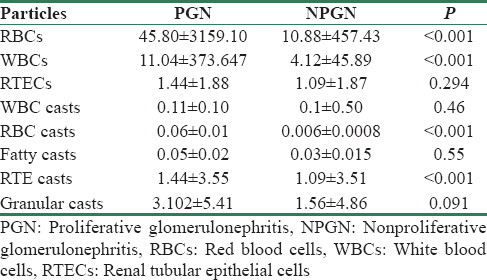 RBCs, dysmorphic RBCs, WBCs, RBC casts, and renal tubular epithelial casts were significantly higher in PGN. A discriminant analysis with the dependent variables being PGN and NPGN and the independent variables being RBC, WBC, and RBC casts yielded a sensitivity of 91.23% and specificity of 58.33% in our study, whilst that done by Fogazzi et al. yielded a sensitivity and specificity of 80.8% and 79.2%, respectively. Dysmorphic RBCs have long been considered a hallmark of glomerular hematuria. The percentage of dysmorphic RBCs used as a cutoff has varied from as low as 20% to as high as 90%., In this study, a cutoff of >40% dysmorphic RBCs had a sensitivity of 91.2% and a specificity of 79.17% in distinguishing PGN from NPGN. In summary, urine sediment analysis when accurately performed is of value in predicting the type of glomerulopathy. As dysmorphic RBCs are seen in nonproliferative GN also, a cutoff of 40% can be used as a screening procedure to recognize proliferative GN which need urgent clinical attention and biopsies. Fogazzi GB. Collection, Preparation and Examination of the Samples, and Report of Urinary Findings, in the Urinary Sediment an Integrated View. 3rd ed. Elsevier; 2009. p. 22-6. Fogazzi GB, Saglimbeni L, Banfi G, Cantú M, Moroni G, Garigali G, et al. Urinary sediment features in proliferative and non-proliferative glomerular diseases. J Nephrol 2005;18:703-10. Mohammad KS, Bdesha AS, Snell ME, Witherow RO, Coleman DV. Phase contrast microscopic examination of urinary erythrocytes to localise source of bleeding: An overlooked technique? J Clin Pathol 1993;46:642-5. De Santo NG, Nuzzi F, Capodicasa G, Lama G, Caputo G, Rosati P, et al. Phase contrast microscopy of the urine sediment for the diagnosis of glomerular and nonglomerular bleeding-data in children and adults with normal creatinine clearance. Nephron 1987;45:35-9. Catalá López JL, Fábregas Brouard M. Acanthocyturia is more efficient in to differentiate glomerular from non-glomerular hematuria then dysmorphic erythrocytes. Arch Esp Urol 2002;55:164-6.